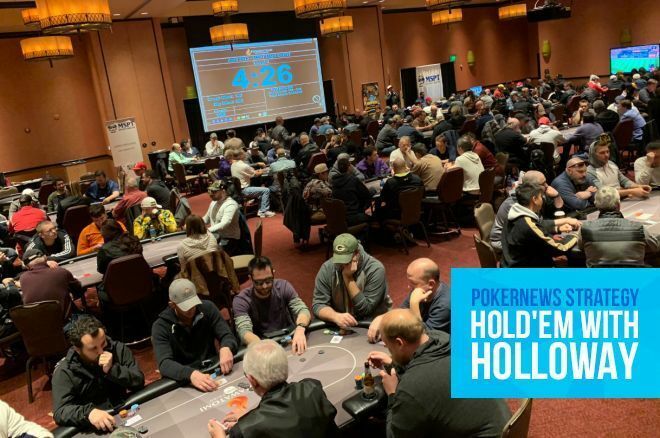 In Hold'em with Holloway, @ChadAHolloway breaks down two big hands from the @msptpoker @paysbigpoker. 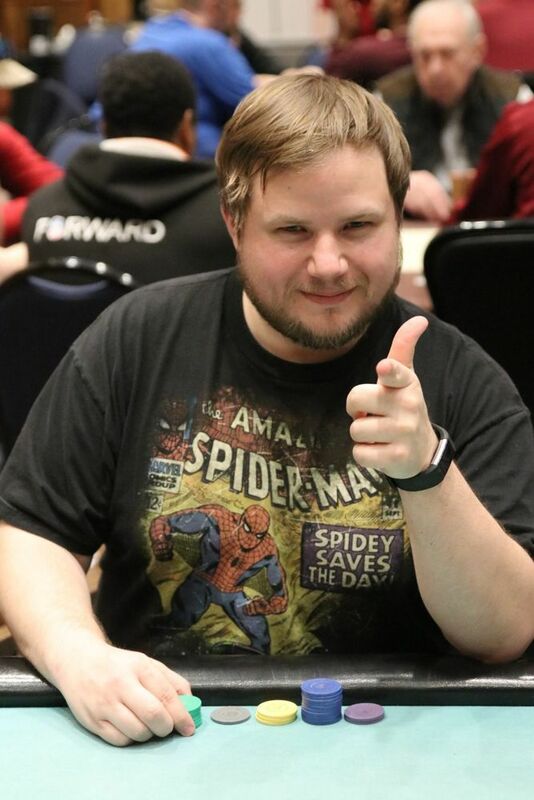 Last weekend I traveled across my home state to fire Day 1b of the Mid-States Poker Tour $1,100 Milwaukee Poker Open at Potawatomi Hotel & Casino. After playing the MSPT Meskwaki a couple of weeks ago and getting above starting stack on just one of my four bullets, I was looking for some redemption. Unfortunately, I didn't get it as I busted my first bullet in just five hands. I late registered the tournament in Level 4 (150/300/300), which is when a player in the cutoff limped and I looked down at offsuit on the button. Not a great hand, but I perceived the limp as weak and thought I might be able to take it down with a raise. As such, I popped it to 1,000. The player in the small blind folded but the woman in the big blind, who was sitting with 40,000 while the rest of us were all around the 20,000 starting stack, three-bet to 2,500. The limper folded, and while I should have done the same, I decided to peel a flop. I figured it was only 1,500 more when I had 1,000 in already, I had position, and my small cards would be fairly easy to play. Either I'd hit and have a chance to double or miss and give it up easy. Not the best plan, but given it was early, we were deep, and I was prepared to re-enter, it's a spot I went with. "I went from the high of an impending double-up to the low of heading to the registration desk to re-enter." The flop gave me an open-ended straight draw and my opponent continued for 3,500. I didn't call a three-bet with four-three offsuit only to fold when I flop a well-disguised open-ender, so the question was whether to call or raise. At this point I put her on a big pocket pair, or perhaps ace-queen, and that I wouldn't be able to shake her. I opted for a call and the dealer burned and turned the . I had hit the nuts and there was little chance she would be able to put me on it. I was elated to see her lead out for another 3,500 and I debated what to do. I considered moving all in but didn't want to scare her off. I also consider just calling, but I didn't want to give her a free card in case she had a set or flush draw. I settled on a raise to 8,000, which left me around 5,000 behind. She made the call and the completed the board on the river. I wasn't thrilled with this card, because I feared it gave her a flush. What two-heart hand would she have three-bet me with preflop? Ace-king of hearts for sure. It couldn't be ace-queen as the queen was on the board. Would she really have three-bet ace-jack suited out of position? I also wasn't crazy about the river heart as it could discourage her from calling my river jam if she put me on a flush draw. As it happened, she checked and I put in the rest of my chips. Much to my surprise, she snap-called and my gut dropped as she rolled over for the nut flush. I went from the high of an impending double-up to the low of heading to the registration desk to re-enter. This hand was a prime example of the risks associated with playing low cards. Sometimes they pay off big, but other times they can cost you your entire stack. My second entry went much better than my first, and by in Level 7 (300/600/600) I had worked my stack up to 30,000. That is when I raised to 1,500 under the gun holding and the player in the big blind, who was sitting with 30,000, defended to see a flop. I'd flopped the nut flush draw, and so was feeling good. Surprisingly, my opponent led out for 3,500. I was not expecting that. I wasn't sure where he stood, though I figured maybe he had flopped a pair and wanted to see where he was at. I just called, then the turn not only paired the board but added a spade flush draw. My opponent bet again, this time firing in 8,000. It was a curious bet and it seemed to me he was trying hard to push me off the hand. If he had trip sevens or a full house, would he be trying to scare me off? I didn't think so. Maybe with a king, but I didn't think he'd bet so big with a cowboy. I then considered that maybe he was on a draw of some sort, maybe a straight draw. He may have even picked up spades. Honestly, I wasn't quite sure, but I thought there was a decent chance I was ahead, and even if I weren't, that I was drawing live to the nut heart flush. Heck, my ace or even nine might be good if I paired it. I called and was crestfallen to see the brick on the river. However, the hand was far from over. My opponent wasted little time in moving all in for his last 9,000 and this sent me in the tank. The hand just didn't make sense to me. If he had a king then he made kings full and moving all in made sense. However, his turn play didn't lead me to believe he had a king. If he had a seven, would he be so quick to jam the last of his chips when I played it as if I had a king? As I reviewed the hand in my head I looked at my opponent and he didn't seem strong. I read his general demeanor as one of nervousness. My live read backed up my gut feeling that something in this hand didn't add up and my ace-kicker might be good. With no re-entry option to fall back on I'd be risking a big portion of my remaining chips, though by that point I'd already committed half my stack. I went with my gut and made the call. My opponent tabled for an inferior flopped flush draw albeit with an open-ended straight draw. The rest of the table was impressed and my confidence got a much-needed boost. While I played for several more hours, the cards failed to go my way. I ultimately busted short of bagging and tagging when I three-bet jammed holding pocket sevens over a raise and limp. The original raiser folded but the limper called with tens and held. Another tournament without a cash, but at least there were a couple of hands worth sharing.